Labor Day is the traditional kickoff to an election year. Folks our quadrennial gubernatorial election year is going to be a doozy. We are in for one heck of a political year next year. Besides the Governor’s race, we have an open Lt. Governor’s race, an open Attorney General’s race, an open Treasurer’s race, and an open Agriculture Commissioner’s race. We have statewide races for Secretary of State and State Auditor. We have five seats up for election on the State Supreme Court. One of those will be a hotly contested battle for Chief Justice. We have two seats up for election on the Public Service Commission. More importantly, we have local races on the 2018 ballot. Local races drive the turnout; all politics are local. All 67 sheriffs run, all probate judges run; there will also be local judicial races and all circuit clerks run. All seven of our congressional seats will be on the ballot. Two of those seats will be in play. Second District Congresswoman Martha Roby is vulnerable and will be challenged and Fifth District Congressman Mo Brooks angered the Washington establishment Republican moneyed power brokers by challenging Luther Strange and he will be in a battle for his political life. The most important races will be for the 35 state Senate seats and 105 House of Representative seats. An unprecedented number of Senators and Representatives will not be running for reelection. Those legislative races will be where most of the special interest money will gravitate. Money follows money. The Legislature appropriates state dollars as well as makes state laws. The Governor proposes and the Legislature disposes. I have observed Alabama politics for quite awhile and 2018 is set to be the best circus I have seen, and I have seen some good ones. There may have been better governor’s races, but from top to bottom of the ballot, this may be the very best. The governor’s race is always the marquee battle royale in Alabama politics. It will get cranked up immediately after the September 26 Republican Senate primary contest, which Roy Moore will probably win. Kay Ivey will officially announce soon. She really began her campaign the day she was sworn in earlier this year. One of her first acts made her a player in the 2018 gubernatorial contest. Robert Bentley had initially called for the open Senate race to be in 2018. However, Ivey had seen polls that revealed that Roy Moore was going to win whatever race he ran for in 2018, whether it was Governor or U.S. Senator. The vague state Judicial Inquiry Commission made him a martyr and hero when they removed him from his Chief Justice post.Neither she nor any host of potential horses would have beaten the Ten Commandment’s Judge. However, she knew that the U.S. Senate seat would allure him and it did. It was an adroit, brilliant Machiavellian move by Ivey. She has moved into the governor’s office and looks gubernatorial. She is in the catbird’s seat in the race for a full four-year term. Her move to have a special election this year rather than a regular election year not only enhanced her odds for election it also cost the state over $10 million. State House of Representatives, Ways and Means Chairman, Steve Clouse, R-Ozark, has wisely and prudently prefiled a bill to clarify the law and clearly state that the election for a vacated Senate Seat would be held with the next general election. It will save the cash strapped General Fund a lot of money in the future. Even though Kay Ivey will be running as the incumbent in the upcoming gubernatorial fray, her entrance has not deterred some major players. Huntsville Mayor, Tommy Battle, will be a player. 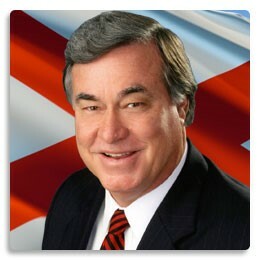 He could run on a platform of saying if I can make the rest of Alabama a semblance of Huntsville, I am your man. Agriculture Commissioner, John McMillan, has won two statewide races and is in the race. Several other viable candidates are not scared of the aging Ivey. Jefferson County Commissioner David Carrington, Birmingham Evangelist Scott Dawson, and State Senator Bill Hightower are already in the GOP contest. Surprisingly two Democratic thoroughbreds are poised to run. Tuscaloosa Mayor Walt Maddox and former Chief Justice Sue Bell Cobb are ready to pull the trigger. PSC President Twinkle Cavanaugh has moved to the Lt. Governor’s race. This is a wise and prudent move by the 50-year old state political veteran. She will be a prohibitive favorite to win that race. It is purely a name identification contest. Her positive name ID is very high.